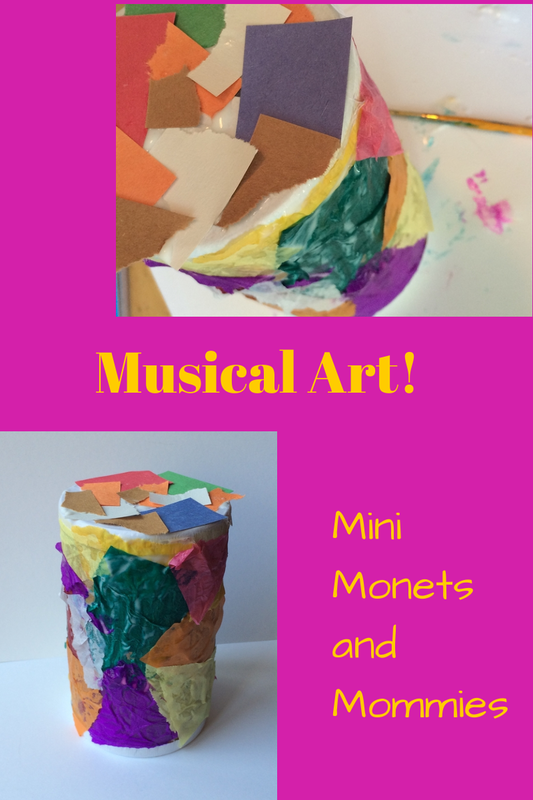 Music and art equals creative fun for kids! This week we tried taking care of the meadow o weeds that have taken over our yard by pouring salt over them (my 805-year-old neighbor swore that it works). Yes, I know that this has nothing to do with children’s music or art-making. But, I’m getting to that. As I was about to pitch the empty cardboard salt canisters I realized that they weren’t entirely empty. When I shook it, the remaining salt (that had sunken way down to the bottom) made a kind of cool sound. So, I figured – why not collage the outside and turn it into an artsy instrument? 1. Peel the label off of the container. 2. Close the spout completely. Cover the spout (and the surrounding area) with tape. 3. 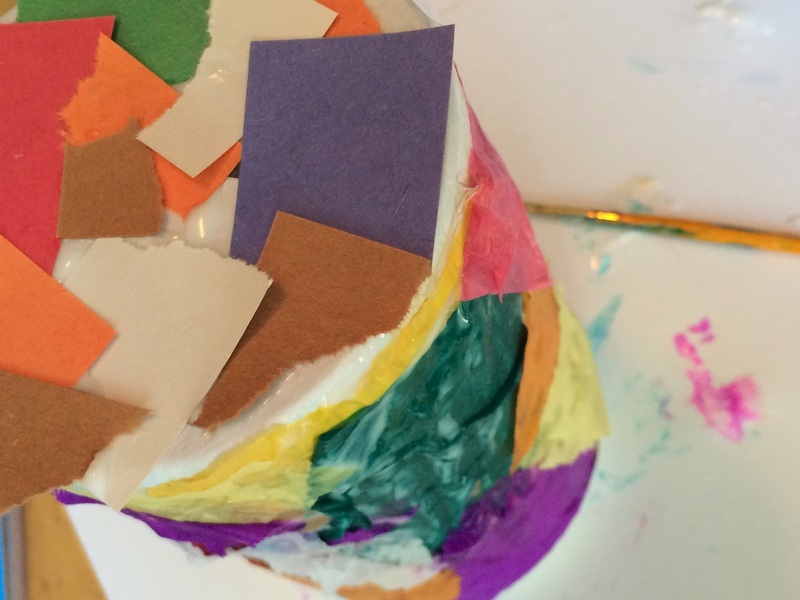 Give your child a rainbow of tissue and construction paper. Have her tear the papers into pieces. 4. Turn the container on its side. Pour a quarter-sized pool of school glue on it. Have your child start spreading the glue out with a paintbrush. 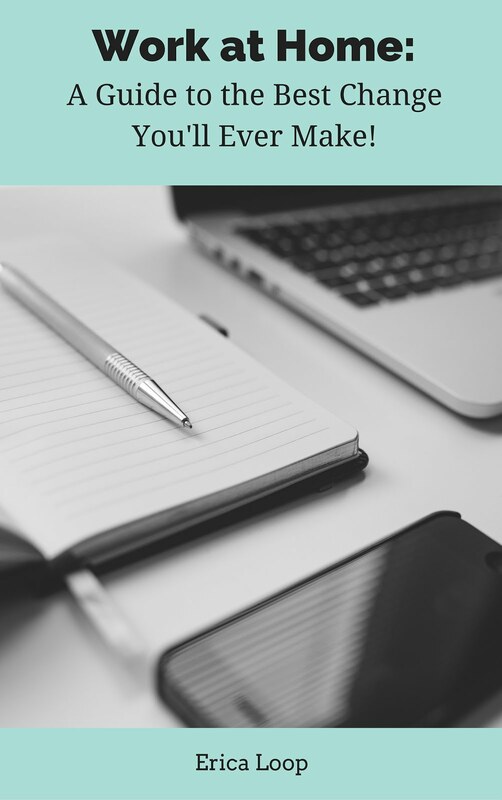 Continue this process until one half is covered. 5. 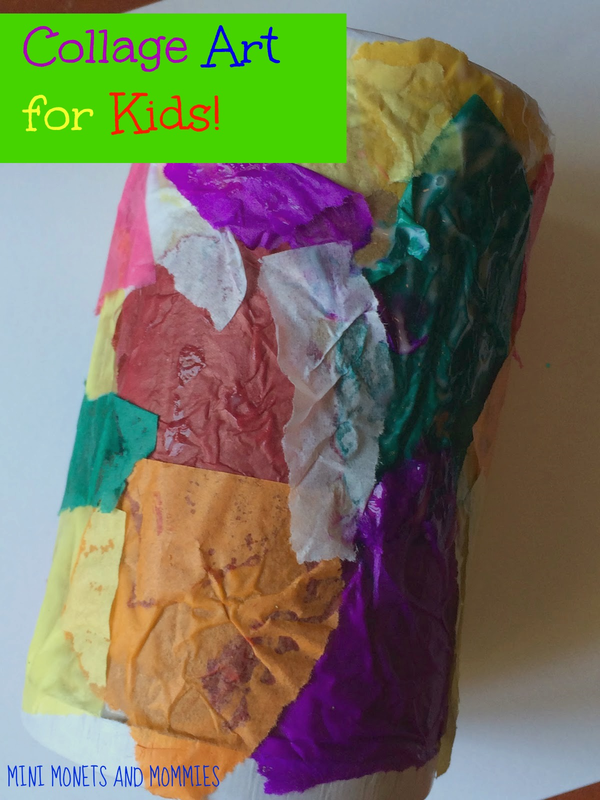 Have your child press the tissue paper onto the glue, collage style. She can add another layer of glue on top to seal the paper and add shine. 6. Repeat the collage steps for the other half of the canister. 7. Add glue onto the top. Have your child collage the top of the container with the construction paper pieces. Let the glue dry. 8. Turn the container over and have your child collage the other end, using more construction paper. When the collaged can dries, she can shake it and make her own music. Another option is to give her wooden spoons and let her use the canister as a mini drum. This is a lovely craft the kids can have fun with too. This is a super cute craft:) Visiting back from onlinesisterhood.com. following you now. Hope you have a great week. Love this craft :] My two year old makes music out of everything and anything so he would LOVE this! I like this craft! It is so useful! It is so fun to take what you have and make something beautiful out of it! :) Great job! What a great idea! Got to remember to save my salt container! ooops instead of editing I accidentally removed. So I commented again.